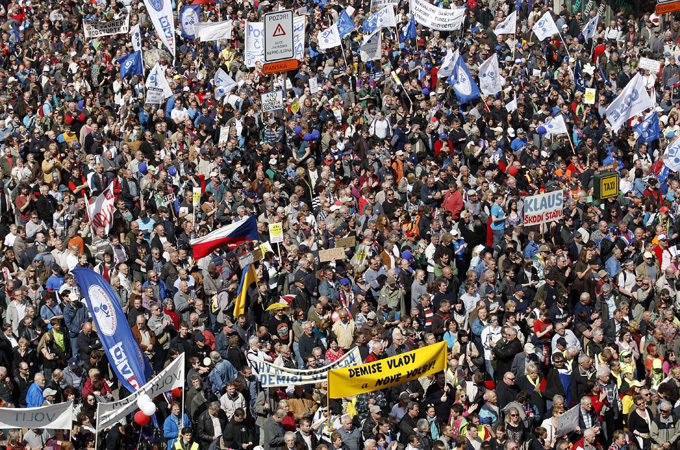 Tens of thousands of Czechs staged one of the biggest protests since the fall of Communism on Saturday, marching in Prague against spending cuts, tax rises and corruption, and calling for the end of a center-right government already close to collapse. In Montreal, 89 people were arrested Saturday after trying to disrupt the second day of a conference on the development of northern Quebec. Tens of thousands of Egyptians demanded on Friday that their military rulers stick to a pledge to hand over power by mid-year after a row over who can run in the presidential election raised doubts about the army’s commitment to democracy. In Bahrain, tens of thousands people marched along a motorway from Budaiya, an area to the west of the capital, Manama, on Friday to demand an end to the crackdown on dissent, ahead of the Formula 1 Grand Prix on Sunday. Thousands demonstrated in the Rome on Friday to protest government plans to introduce legislation that will make it easier for companies to sack employees. Less than 24 hours after their release, University of Texas students arrested after staging a sit-in at President Powers’ office gathered with supporters Thursday on the steps of the UT Tower to continue in their campaign against sweatshop labor. Tens of thousands of teachers, doctors, police officers and other public workers went on strike on Wednesday in Slovenia over proposed pay cuts under austerity measures to rein in the euro-zone member’s budget deficit.